The fully grown larva is pale yellow in colour with orange yellow head. 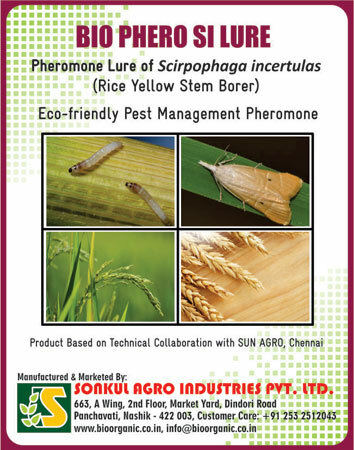 It passes winter in rice stubbles and destruction of rice stubbles also thus helps in reducing incidence of this pest. The moth has yellowish forewings with a single dark spot in the centre of each wing. Moth measures 1.3 cm long and 3.2 across stretched wings. Female moth has yellowish forewings with a single dark spot at their centre while the male has numerous small brown spots. A fully grown larva is formed in about 20- 40 days depending upon the climatic conditions. A developed larva measures about 20 mm in length and is white or yellowish-white in colour. Larva makes an exit hole and pupates within the larval tunnel, usually at the base of the plant. Generally two or three generations of this pest is completed during a single crop. Winter and heavy rains are inimical to this pest. Stem borer completes its life cycle in 40-45 days. Only larva causes damage to the crop. After hatching, larva bores in to stem and damages it. Damage during vegetative stage results in drying of central shoot, damage symptom called “dead heart”. Damage after flowering results in white empty straight panicles called as “white-ears”. As dead-hearts and white-ears harbor larvae, their collection and disposal helps in reducing incidence of this pest.